The scene from the Memorial Day parade, May 30, 1941, is at State Street with the view facing the south side of the street. Cars and people line both sides of State Street, the people watching the parade of men. Three street lights, one a solid concrete structure, are located on the north corner of State Street where it intersects High Street. 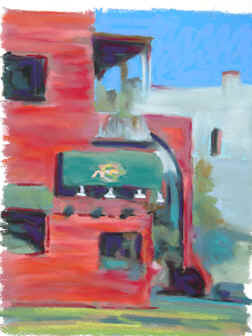 My painting is across this building, which is now a parking lot, looking to Jonathon’s Oyster Bar.